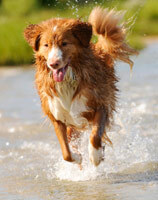 Osprey Shores is a dog friendly resort on Nova Scotia’s Eastern Shore. We understand your pet is an important member of your family when you travel so we invite you to bring your well-behaved dog along with you when you visit our resort. When you make your reservation, please let us know that you are bringing your dog, the breed of your dog and his or her name so we can have a welcome package ready for your furry friend when you arrive. While we offer pet friendly rooms, we generally only accept small to medium-sized (less than 50lbs) dogs. Exceptions can be made and you will need to inquire about this at the time you book your accommodations. Dogs can not be left in the room unattended. Exceptions will be considered but you must get approval from the resort office. You are required to sign our pet policy at check-in. The trail along Mussel Cove is an excellent spot to walk your dog in the morning. Dogs are not allowed on the golf course. Osprey Shores has been independently certified by Pets Can Stay™ as meeting or exceeding all criteria required for the Standard Certification designation. The Pets Can Stay™ certification is your assurance as a traveler that you are staying in pet friendly lodging that enhances the travel experience of travelers with pets.